Gabriel Weinreich is an Emeritus Professor at the University of Michigan. He received a Ph.D. in Physics from Columbia University in 1953, working under the direction of the Nobel laureate, I. I. Rabi. He subsequently worked at Bell Labs on fundamental properties of semiconductors; he is credited with the theory and observation of the acoustoelectric effect, where an ultrasonic wave in a semiconductor gives rise to a direct electrical current. In 1960 he accepted a professorship at Michigan where he became renowned for his teaching and for his lecture notes on elementary physics and on musical acoustics. He published books on the theory of condensed matter (1965), thermodynamics (1968) and extended vector mathematics (1998). His contributions to research included the discovery (with Franken, Hill and Peters) of optical harmonics, his theoretical studies of vortices in liquid helium, and his measurements of electron-atom scattering. In the mid-1970s Weinreich turned to theoretical and experimental research in musical acoustics with a vigor that convinced the NSF to provide financial support for an extended period . His studies of the piano gave new understandings of the hammer-string interaction and of the coupled motions of piano strings. His studies of the violin showed how the directional pattern of acoustic radiation from the instrument influences the perceived tone color. He also invented an electronic violin bowing system and devised a new way to measure mechanical admittance in violins. This work continued well beyond his formal retirement in 1995. In recent years, Weinreich has collaborated with the violinmaker Joseph Curtin on the development of an electric violin that can be held and bowed exactly like a traditional violin (let’s call it a Stradivarius) but that outputs an electrical signal which, when fed into a traditional amplifier and speaker, produces the sound of the Stradivarius as it would be picked up by an excellent studio microphone. This would meet the frequent need for a violin to be played in concert venues that demand amplified sound. The Weinreich-Curtin electric violin has a solid body with a normal fingerboard and with strings that are bowed in the usual way. 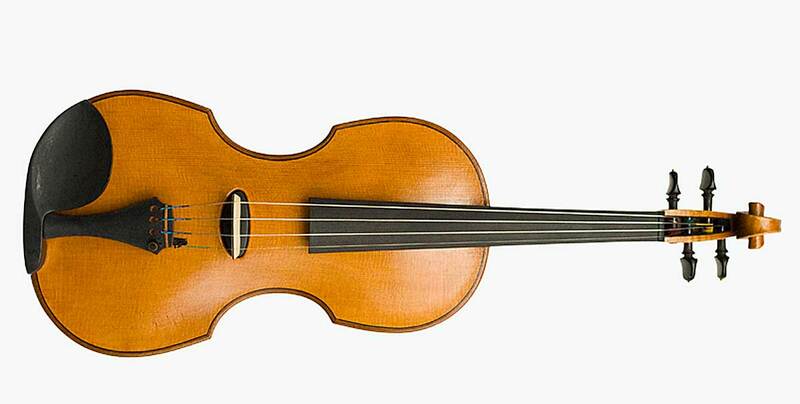 Vibrations are picked up by several sensors, digitized, and combined in real time with the previously measured impulse response of the real Stradivarius. In this way all the bowing gestures of the violinist are combined with the playing characteristics and sound of the Stradivarius, but with an instrument that costs far less than the original.